Three days before Garba Bakunawa traveled from Nigeria to Harvard for a nearly month-long course on global healthcare delivery, an electrical injury with the potential to imperil his ability to practice surgery knocked him unconscious. Heavy rains had flooded parts of his community in northeast Nigeria and damaged the local power provider. Abnormal voltage flares were causing problems throughout the area. He awoke on June 29 to the furious chirp of wires sparking in the ceiling of his house. Telling his family to remain behind him, Bakunawa reached for the control box in the house to cut the power—and everything went black. “I remember that I made an effort to touch it, but I can’t remember what happened next,” he said. “I just remember that I woke up on the way to the hospital and my brother was telling me that I was electrocuted.” By his account, he was luckier than most. The electrical problems injured many in his community, and even killed a few people. “At least I was healthy enough to walk around,” he said. After 12 hours in the hospital, he left on a regimen of antibiotics and with his right arm covered in a large cast. The shock had heavily charred the skin of his hand. It was not clear if he would recover well enough to practice again. Bakunawa was due in Cambridge the following week for the start of the 2018 Global Health Delivery Intensive (GHDI), a three-week program jointly offered by the School of Public Health (HSPH), the Medical School (HMS), and Brigham and Women’s Hospital that convenes mid-career health professionals from across the globe for lessons about improving access to key health treatments. Voted an outstanding member of his hospital’s staff, Bakunawa received funding to attend the program and had already booked his ticket to Boston before his injury. His family urged him to try to reschedule. He would not be swayed. 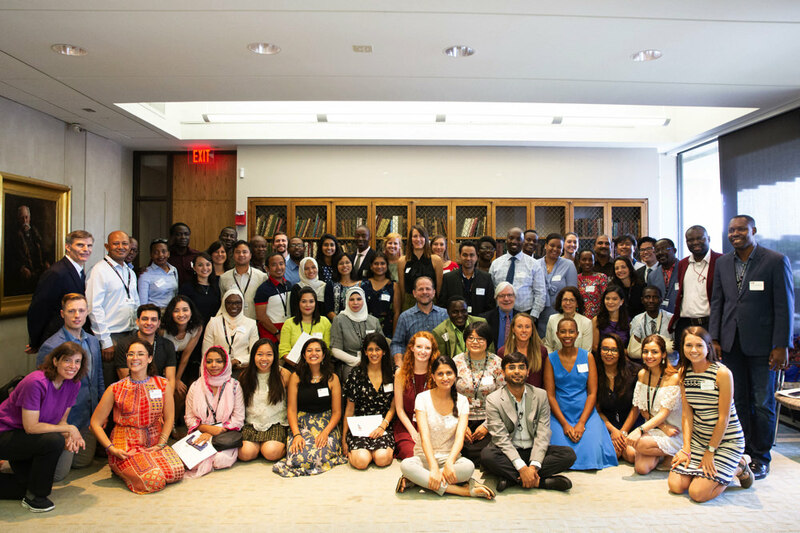 In Boston, he joined a 55-member cohort of summer student learners representing 27 countries and a wide array of professional backgrounds, including in nonprofit leadership, clinical care, and community health work. More than half of that cohort labors in “resource poor settings” and a plurality of program participants are direct patient care providers, according to demographic data gathered by the program’s leaders. While Harvard does not provide financial assistance for the program, almost 90 percent of this year’s cohort received financial support from outside sources such as scholarship or training programs, or from employers, to cover the program’s $8,000 tuition fee. Sources of support came from a wide array of local and international organizations such as Massachusetts General Hospital and the HMS Center for Global Health Delivery in Dubai (which funds ten full and ten partial scholarships to GHDI). In some ways, Bakunawa’s experience navigating dramatically different care infrastructure in Nigeria and the United States underscores the mission of the GHDI: to provide healthcare professionals with the know-how to standardize levels of care globally. GHDI grew out of a larger effort launched nearly 11 years ago (the Global Health Delivery Project, GHDP), which sought to standardize a “lexicon” that healthcare professionals could apply to their respective regional contexts, said GHDP faculty director Rebecca Weintraub in an interview (she is assistant professor of global health and social medicine at HMS). Eleven years ago, she said, her team set out to generate “what we viewed as novel public goods”—in this case, resources about best practices for global health professionals, including case studies similar to those created at the Business School, with step-by-step descriptions of how health professionals tackled issues in their regions, designed to help alleviate the disparities in levels of care and infrastructure that exist across the world. Harvard’s focus on global health is wide-ranging and continues to expand: it has launched more than 120 global-health related offerings, from Business School executive-education leadership programs to an undergraduate secondary field that focuses on interdisciplinary study of healthcare, policy, and science. GHDI, while not a degree- or certificate-granting program, is just as intensive as most other HMS courses. During their time in residence, students enroll in three courses—“Epidemiological Methods for Global Health,” “Introduction to Global Healthcare Delivery,” and “Management Practices in Healthcare Delivery”—which are meant to provide an interdisciplinary introduction to how health professionals tackle public health issues that recur worldwide. A combination of Harvard professors (some from HMS, HSPH, and the Kennedy School) and guest lecturers who work in healthcare teach the courses, which typically run 2 hours per session. One GHDI case study this year examined a mother of three in rural Kenya whose youngest son developed a fever. A community health worker diagnosed him with malaria. The mother (named Esther in the study) could not find the prescribed antimalarials and mosquito netting for her children at the village drugstore, and she couldn’t get the materials from neighboring villages because their pharmacies were either out of stock or charged exorbitant fees. The case served as the starting point for a discussion on best practices for “last-mile logistics,” or how supply chains deliver their products to patients. The session pushed students to consider the inefficiencies at every step of the delivery process, from communication errors or demand fluctuations, that might lead to stock-outs during a crucial time of need. Other cases tackled issues such as the role of diplomacy in healthcare, community-based solutions to healthcare, and financing. In one wide-ranging session of the management-practices course, Kolokotrones University Professor of global health and social medicine Paul Farmer—who chairs the eponymous department and co-founded the nonprofit Partners In Health—spoke at length about the challenges facing healthcare professionals: distrust of nonprofit organizations in places like Haiti (where Farmer and Partners have long been active); the need to understand historical context when planning broad care efforts; and continuing debates over how to define “equity” and “universality” in care. He stressed the importance of addressing such issues explicitly. “When you impoverish a discussion about healthcare for decades, a lot of not talking about it, I tend to believe any discussion of universality is a good one,” Farmer said. He put current discussions about the universality of healthcare into the context of American upheavals such as the abolitionist and civil-rights movements. Though coursework is a major component of the experience of the GHDI, program coordinator Davin Eurich said networking and opportunities for peer-to-peer learning bolster the graduates’ experiences. GHDI has graduated 350 students from 60 countries so far. Many have returned to work in the ministries of health of their respective countries or to aid nonprofits in region-specific work, while others return to local hospitals to deploy the new knowledge they have acquired. Bakunawa will return with that—and more. 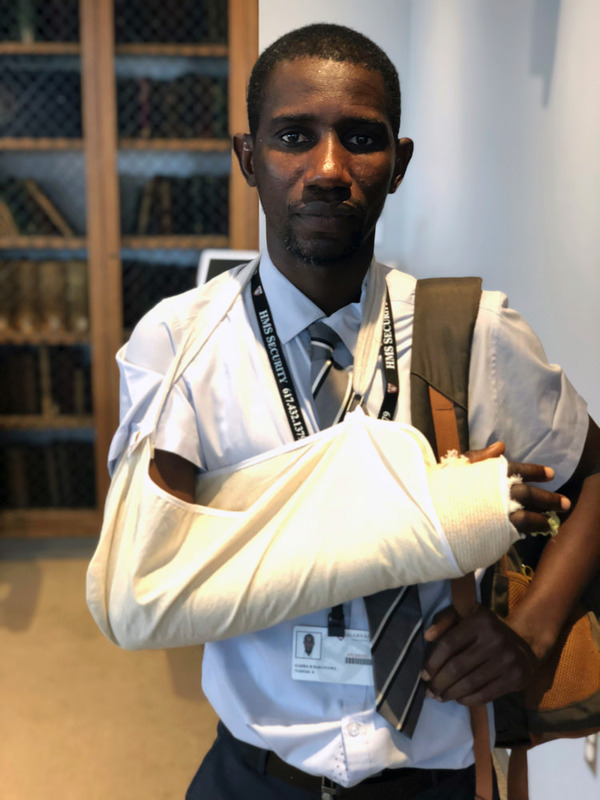 One day, during a lecture in the beginning of the program, Bakunawa raised his hand to answer a question, and HMS professor and GHDI co-director Joseph Rhatigan noticed the injury to his hand for the first time. “That day he sent me a message saying there was a doctor, a hand surgeon, who would like to review me, and he was able to link me with a plastic surgeon,” Bakunawa said. “Just like a family, they treated me very well.” Faculty from the program, HMS instructors, and physicians at Brigham worked to provide Bakunawa with surgery free of charge, including skin grafting to the affected areas on his hand and the removal of one of his fingers, which had been badly damaged. At the graduation ceremony on the last day of the program, the students heard from Stephen Kahn, president of the Abundance Foundation, an organization that helps train nonprofit leaders who work on the intersection of health, arts, and education. Kahn graduated with the first cohort of the program, and the foundation he now heads has supported Partners In Health in the past, and according to Eurich, provides financial support to GHDI that helps the program’s leaders improve the course offerings each year. “I thumbed through my Merck manual, hoping the pages would answer the endless cascade of questions I had. All I had was my clinical vigilance,” he said. Kahn called GHDI a “profound turning point” for him, and stressed that the program’s emphasis on providing political and historical context for its cases helped deepen his understanding of how to address public-health crises. Moreover, he emphasized that relying on the network of GHDI graduates has strengthened his work—by providing professional advice and by helping him weather the toughest moments of being a healthcare provider.